Occy is many peoples' favourite surfer - commentators at surf comps can't get enough of his humour. Occy sponsored by Billabong (still part of it I believe) - are both icons of the Gold Coast. Mark Occilupo [Occy] was a brilliant surfer as a youngster going head to head with Tom Curran in many exciting events including Bells Beach. Known as 'the raging bull' he managed to prolong his career to be the oldest surfer to win a world title (1999) at the time (33). Occy has a unique powerful surfing style - great to watch on his backhand in solid waves. 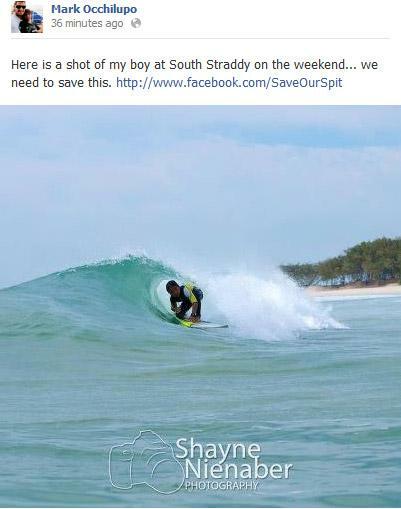 Click the image to see Occy's son surfing strad on the weekend. Who wouldn't want to see Strad be available for their kids and their kids kids. Have a close look at the trees and lack of high rises in the background - you could be anywhere which is why we are passionate about protecting this place. Hi everyone, I have a favour to ask, there is something I hope together we can do and that is "Save Our Spit" I have seen this type of development destroy other places around the world and would hate to see it happen to probably the best wave on the coast, well certainly in the top 5. Please go to http://www.facebook.com/SaveOurSpit Like their page and give them your support, because in the long run it benefits us all.